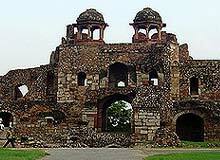 The Purana Quila or the old fort was constructed by Humayun and Sher Shah. The old fort complex covers an area of about a mile. The walls of Purana Quila have three gates (the Humayun Darwaza, Talaqi Darwaza and Bara Darwaza) and are surrounded by a moat, which was fed by river Yamuna. The double-storied gates of the Purana Quila are quite massive and are built with red sandstone. The walls of the old fort are said to be built by Humayun while the buildings in the old fort are attributed to Sher Shar, the Sur ruler. Of all the surviving buildings in the old fort complex, the Sher Mandal and the Quila-i-kunha Mosque are notable. Excavations have revealed that the Purana Quila or the old fort stands at the site of Indraprasta, the capital of the Pandavas. Excavations near the eastern wall of the fort show that the site had been occupied since 1000 B.C. The PGW (Painted Gray Pottery) recovered from the site date back to the Mahabharata period.